Rachel Smith might have not become so hooked on CouchSurfing if her first experience hadn’t been a really magnetic event. What are her favorite CS events to this day? Below, she lists her top 5, and tells us what was so awesome about each one of them. The most creative and indulgent CS event I’ve ever been to was a holiday cookie party. At a CouchSurfer’s apartment, we made and shared Christmas cookies. I brought my own recipe — special apple spice! Later, we played some intense rounds of Wii bowling. What a night! 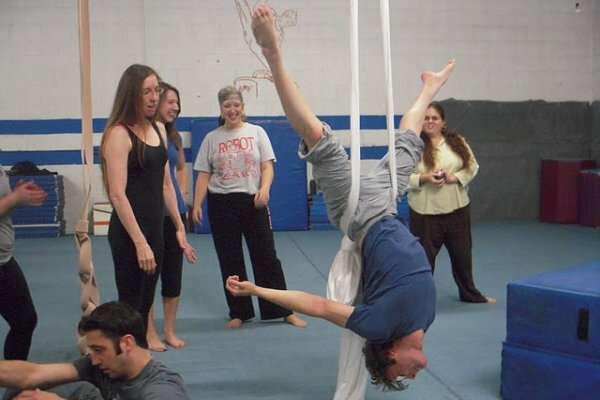 Since circus arts are both a hobby and a part-time job, I decided to host an open house to teach these skills to CouchSurfers. My talented friends volunteered to help for an evening, and everyone had fun juggling, swinging on the trapeze, and hanging upside-down in the air. Lesson learned: CouchSurfers are willing to try anything! The first event I ever attended was a Chicago museum trip. We visited the Museum of Science and Industry and had a picnic by the lake. The adventurous ones even went swimming, but a violent storm caught us by surprise and forced us to take shelter in a local bar where we waited out the storm over a few pitchers of beer. A great day in Chicago – Rachel Smith is the smiley girl in red. 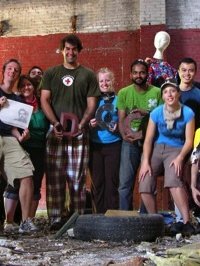 Visiting the City Museum was part of the St Louis Couch Crash, but it was by far the best part of it. The museum is like a giant playground for grown-ups and kids alike, made out of reclaimed building materials from the city. The best way to get to know a group of CouchSurfers is to do an activity with them, and we had fun climbing through caves and airplanes and going down the stories-high slide. With all the creative minds in this city, the Chicago Couch Crash turned out quite spectacular. There were visits to the museum, comedy shows, a fire performance on the beach, an arena concert, a board game night for those who didn’t wish to party, and a huge bonfire barbecue for those who did. Chicago has more to offer than I imagined, and I grew up here! Though the term “invasion” may be relatively new, the idea is not. Major cities such as Paris and Vienna were some of the first cities to host invasions. This year’s second edition of Vienna Calling, which took place in June, was a five-day event that drew an estimated 400 people for a series of barbecues, workshops, parties and more. Paris’ fourth invasion, Paris Rendez-Vous, this July, had over 350 people subscribed. While these events have become traditions in the CouchSurfing community, many other invasions are popping up in other cities. This year’s Detroit Couch Crash included a “Forgotten Detroit Track” — where participants visited abandoned buildings and passed out food to the homeless –, a photo contest, and trips to local thrift shops. There’s always a new city being invaded. 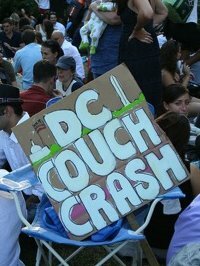 Washington DC’s 1st Couch Crash took place on Independence Day — could there be a better way to celebrate this North-American holiday? Kari Hatfield, who came from Baltimore for the Crash, said she “loved everything about it: the community, the camaraderie, and the events.” In the program were museum and monument tours, visits to some of DC’s most diverse and historic neighborhoods, and watching fireworks over the Washington Monument. While most invasions aim to include an array of activities diverse enough to please all sorts of people, there’s a recent trend of invasions catering to specific interests. At the Slovenia Invasion for Motorbikers, CouchSurfers completed a heart-shaped route through the country, with an inevitable stop at the Motorcycle Museum on the way. And Glasgow’s Scottish Invasion focused on an art and music festival with plenty of Gaelic folk music and dancing.